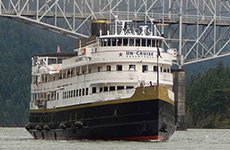 Come aboard the 88-guest S.S. Legacy and take a step back in time. This replica coastal steamer exudes old-world charm, with the benefits of modern comforts. Simultaneously elegant and casual, the vessel boasts carved wooden cabinetry and turn-of-the-century décor. Four decks provide ample outside viewing opportunities and relaxing public spaces for taking a stroll at sunset and gathering with new friends. The lounge offers a full bar, the open-seating dining room includes a wine bar, and, for a step back in time, sidle up to table in the Pesky Barnacle Saloon. The onboard wellness program is accessible to all guests and includes two hot tubs on the bridge deck, a sauna, fitness equipment, yoga classes, and massage suite. Elevator access is available to three of the public decks. Portland is well known for its cutting edge rock'n'roll, though Shakespeare, Broadway shows, ballerinas, chamber music ensembles and full blown classical orchestrations exist here. Try one of many outdoor activities available year round with views of some of the country's best scenery. Portland has historical and cultural monuments, museums, and historic sites. According to a recent CNN survey, Portland is one of the five most "kid-friendly" cities in the United States. Portland has OMSI (the Oregon Museum of Science and Industry), the nations fifth largest science museum, the Oregon Zoo, and the Children's Museum with a strict "please touch" policy. For adventure, head for the indoor North Clackamas Aquatic Park, with its four foot waves and water slides, or visit an old fashioned Oaks Amusement Park, featuring roller coasters, thrill rides, a train, go carts, and bumper cars. There is plenty to do around the Port of Hood River Marina in Hood River, Oregon. The waterfront around Hood River offers many activities, including watersports, fishing, dog walking, windsurfing, kiteboarding, kayaking, sailing, and Hood River Yacht Club activities. There is also a grassy landscape and sand for visitors to enjoy, as well as a picnic shelter and the Marina Green, which provides space for larger events. Westward expansion and the gold rush shaped the Washington Territory, and modern Walla Walla's sites offer a perfect sampling of the renown regional wines, art and history of the Pacific Northwest. Visit an old pioneer's settlement at Fort Walla Walla's museum, the Heritage Station Museum for rotating exhibitions, or the Tamastslikt Cultural Institute in nearby Pendleton to learn about the regional native tribes of Washington and Northern Oregon. Lovers of art and theatre will find much to do in Walla Walla, with a local foundry, numerous galleries, and annual summer outdoor symphonies. Other annual festival highlights include the Walla Walla Sweet Onion Blues Fest and the annual Balloon Stampede in May. With 1,500 acres of vineyards in the surrounding countryside, wine-tasting waits as a reprieve from the site-seeing, as does the hiking of nearby trails, exploring the many rivers and lakes, or horseback riding. As the center of viticulture in the Yakima Valley, Red Mountain's vast landscape is painted by over 600 acres of vineyards, including Ciel de Cheval, Klipsun, Hedges Vineyard, Kiona Artz and more. Wineries like Soos Creek, L'Ecole, Seven Hills Winery are just a number of the wineries that are tucked away throughout the Red Mountain region. Red Mountain is named for the red grass that grows on its slopes, and is characterized by a low elevation, though it is distinct against the picturesque foothills of the Washington desert landscape. The climate and land have provided ripe ground on which to both grow grapes, produce wine and relax at the multitude of wineries to enjoy it all. Located at the northern border of Oregon, on the banks of the Columbian River, The Dalles was a major Native American trading center for thousands of years. The Fort Dalles Museum, housed in the only remaining building from the mid-19th century military outpost, features a collection of military artifacts, household goods and old medical equipment from the early days of the city. Recreational activities in The Dalles include river rafting, fishing and camping. Windsurfing is also a very popular pastime in The Dalles and the area has gained a reputation as one of the best places to learn and practice the sport. The Mayhill Museum in Washington overlooks the picturesque Columbia River Gorge, and is one of the most fascinating cultural institutions in the Pacific Northwest. The museum hold more than eighty sculptures and a lovely collection of French art pieces. The area around the museum is beautifully scenic and visitors can explore, historic sites, hiking trails, and wineries.